A strangely topical 25 years ago picture. Now that Travelling Post Office (TPO) vehicles have finally ceased to run on Britain's railways, it is interesting to note that it is exactly 25 years since the Bangor-Crewe TPO ended. 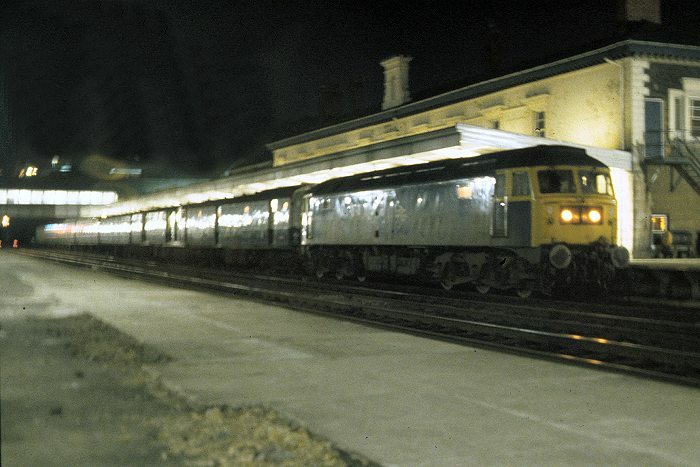 Here at Bangor on Friday the 9th February 1979 is the last up direction working behind 47529, awaiting its 21:01 departure time. The train actually ran from Holyhead to Crewe, but the postal vans were only used to/from Bangor. One of the interesting features of this train was the ability to post a letter into a letterbox in the side of one of the TPO carriages. Unfortunately, a letter posted on this evening to gain the historic 'last night' postmark, arrived un-franked! The TPO along the North Wales coast was re-introduced for a period in the 1980s, but has long since been withdrawn. Ironically, the GPO sorting office in Bangor moved from Deiniol Road to a site on the edge of the goods yard, but no mail travels to the station any more.